Dates before the calendar reform of 26 January 1918 in Russia are according to the Julian calendar. The Committee of Ministers functioned simultaneously with the second session of the Council of Ministers for six more months; Count Sergei Witte participated on both entities until the abolition of the committee on 23 April (5 May) 1906. Following that event, the duties of the committee were left to the Council of Ministers, until the formation of the Small Council in 1909, which also included deputy ministers. By the order of Emperor Nicholas II, the second session of the Council of Ministers began on 19 October (1 November) 1905, following the formation of the State Duma. Shortly after the February Revolution and the inception of the Russian Provisional Government on 2 (15) March 1917, Georgy Lvov from the Constitutional Democratic Party and Alexander Kerensky from the Socialist Revolutionary Party became joint Minister-Chairmen. The provisional Russian Republic was eventually replaced by the Russian Soviet Federative Socialist Republic (RSFSR) and the governmental body by the Council of People's Commissars, which was chaired from 1917–24 by Vladimir Lenin. That body was renamed Council of Ministers following a decree of the Supreme Council on 23 March 1946. After the fall of the Soviet Union, Boris Yeltsin, as the President of the Russian Federation, was automatically appointed as the Head of Government of the Russian Federation in the first two years of his mandate. The latter body took the previous name "Council of Ministers", the chairman of which became Viktor Chernomyrdin from the Communist Party of the Russian Federation, replacing acting chairman Yegor Gaidar. According to the new constitution ratified on 25 December 1993, those two entities were separated. Since then, the head of that office takes the formal title "Chairmen of the Government" or colloquially "Prime Minister" (the only actual prime minister was Valentin Pavlov). Chernomyrdin resumed chairing the government, followed up by non-partisans and acting office holders. On 8 May 2008, Vladimir Putin took the office for a second term, now as a member of United Russia. Dmitry Medvedev has been the Chairman of the Government since 8 May 2012. The youngest head of government by his accession to office was Count Karl-Fridrikh Golshteyn-Gottorpsky, at age 26, and the oldest Count Pyotr Andreyevich Tolstoy, at age 81. Since the 18th century, a modern system of public administration was going to be created in Russia, including the formation of bodies whose powers are similar to the powers of the modern Russian Government. In the period from 1726 to 1905 there was no official title for the leader of the government. The chief ministers (principal ministres) of certain Emperor of Russia nonetheless led the government de facto, but de jure the head of government was a monarch. The modern government type in Russia came after the establishment of the Council of Ministers on 1 November 1905, created for the "management and union action principal chiefs of departments on subjects like law and senior public administration", and modelled on the relevant institutions within the constitutional states, when all the ministries and directorates have been declared part of the unified state management. [clarification needed] The first Prime Minister was Count Sergei Witte, who was appointed on 6 November 1905. After the alleged abdication of Nicholas II from the throne in favor of his brother Michael, Michael also abdicated, before the convening of the Constituent Assembly. On 1 September 1917, Russia was proclaimed a republic. At this period a provisional government was formed, the Prime Minister was the head of state. The heads of Government of the White Movement during the Civil War were de facto Prime Ministers in exile. Prime Ministers of the Russian SFSR. The Heads of Government of Russia after the collapse of the Soviet Union. The first Head of Government of post-Soviet Russia was Viktor Chernomyrdin. ^ Headed the government as President of Russia, was not the Prime Minister. ^ De facto took this position on 31 December 1999, when he became Acting President after the resignation of Boris Yeltsin. Elected President on 26 March 2000, officially took office on 7 May 2000. ^ "Комитет министров". Brockhaus and Efron Encyclopedic Dictionary: In 86 Volumes (82 Volumes and 4 Additional Volumes). St. Petersburg. 1890–1907. ^ "Совет министров". Brockhaus and Efron Encyclopedic Dictionary: In 86 Volumes (82 Volumes and 4 Additional Volumes). St. Petersburg. 1890–1907. ^ "Ministers' Council established in Russia". Presidential Library Named After Boris Yeltsin. Retrieved 10 August 2014. ^ "The Russian Government – Dmitry Medvedev". Government of the Russia Federation. Retrieved 4 April 2014. ^ "Верховный тайный совет". Brockhaus and Efron Encyclopedic Dictionary: In 86 Volumes (82 Volumes and 4 Additional Volumes). St. Petersburg. 1890–1907. ^ Салтыков, князь Николай Иванович [Prince Nikolay Ivanovich Saltykov] (in Russian). Retrieved 7 April 2014. ^ Неизвестная Фемида : документы, события, люди [The Unknown Themis: Documents, Events, People] (in Russian). ОЛМА Медиа Групп. 2003. p. 93. ISBN 978-5-224-04224-1. ^ Кочубей, князь Виктор Павлович [Prince Viktor Pavlovich Kochubey] (in Russian). Retrieved 8 April 2014. ^ B. V. Ananych, ed. (2008). Управленческая элита Российской империи: история министерств, 1802–1917 [Ruling Elite of the Russian Empire: History of Ministries, 1802–1917] (in Russian). "Лики России". ^ Васильчиков Илларион Васильевич — Биографический указатель [Illarion Vasilyevich Vasilchikov – Biography] (in Russian). Archived from the original on 9 February 2014. Retrieved 5 April 2014. ^ Vladimir Nikolayevich Balyazin; Voldemar Nikolayevich Balyazin (2008). Царский декамерон: От Николая I до Николая II. Исторические книги В.Н. Балязина (Historical Books by V. N. Balyazin) (in Russian). 2. ОЛМА Медиа Групп. p. 49. ISBN 978-5-373-01976-7. ^ a b Александр Иванович Чернышев — Биографический указатель [Aleksandr Ivanovich Chernyshov] (in Russian). Retrieved 5 April 2014. ^ Землевладельцы Панинского района. Князь Орлов Алексей Фёдорович [Landowners of the Panin Rayon. Prince Alexey Fyodorovich Orlov] (in Russian). Retrieved 9 April 2014. ^ Орлов князь Алексей Федорович [Prince Aleksey Fyodorovich Orlov] (in Russian). Archived from the original on 7 April 2014. Retrieved 4 April 2014. ^ Павел Павлович Гагарин [Pavel Pavlovich Gagarin] (in Russian). Russian Empire. Archived from the original on 7 April 2014. Retrieved 5 April 2014. ^ a b Игнатьев Павел Николаевич [Pavel Nikolayevich Ignatyev] (in Russian). Russian Empire. Archived from the original on 7 April 2014. Retrieved 5 April 2014. ^ a b Валуев Петр Александрович [Pyotr Aleksandrovich Valuyev] (in Russian). Russian Empire. Archived from the original on 7 April 2014. Retrieved 5 April 2014. ^ a b Рейтерн Михаил Христофорович [Mikhail Khristoforovich Reytern] (in Russian). Russian Empire. Archived from the original on 7 April 2014. Retrieved 6 April 2014. ^ a b Бунге Николай Христианович [Nikolay Khristianovich Bunge] (in Russian). Russian Empire. Archived from the original on 8 April 2014. Retrieved 7 April 2014. ^ Дурново Иван Николаевич [Ivan Nikolayevich Durnovo] (in Russian). Russian Empire. Archived from the original on 8 April 2014. Retrieved 7 April 2014. ^ a b "Витте Сергей Юлиевич (sic!)" [Sergey Yuliyevich (sic!) Witte] (in Russian). Russian Empire. Archived from the original on 8 April 2014. Retrieved 7 April 2014. S. M. Seredonin, ed. (1902). Т. 1 : Комитет министров в царствование императора Александра Первого (1802 г. сентября 8 – 1825 г. ноября 19). – 1902. [Vol. 1: Committee of Ministers During the Reign of Emperor Aleksandr the First (8 September 1802 – 19 November 1825). 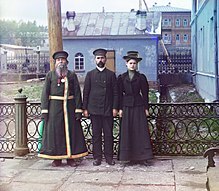 – 1902] (in Russian). 1. Government Public Historical Library of Russia. B. Yu. Ivanov; B. M. Karev; E. I. Kuksina; A. S. Oreshnikov; O. V. Sukhareva, eds. (1999). История отечества [History of the Fatherland] (in Russian). Moscow: Большая Российская энциклопедия (Large Russian Encyclopedia). pp. 554–576. K. K. Arsenyev, ed. (1911–1916). Новый энциклопедический словарь [New Encyclopedic Dictionary] (in Russian). 1–29. Saint Petersburg: F. A. Brockhaus and I. A. Efron.